Algeria was invaded and captured by the French in 1830. 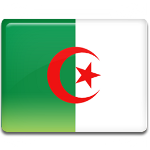 From 1848, France administered Algeria as an integral part of the nation. This overseas territory became home for hundreds of thousands of European immigrants. French settlers (Pied-Noirs) enjoyed all the privileges, while local Muslim population lacked economical and political status. Increasing tensions between the two groups sparked the Algerian War. On November 1, 1954, the members of the National Liberation Front launched a series of attacks against police and military targets, killing five Pied-Noirs and two Algerians. This day is now known as Toussaint Rouge (Red All-Saints' Day). The Algerian Revolution lasted for over seven years and resulted in Algerian independence and exodus of the Pied-Noirs. The anniversary of its beginning was designated as a public holiday named Revolution Day. Algeria's Revolution Day is celebrated nationwide. The holiday is marked with political speeches, rallies, parades, cultural events, etc. Since it is a non-working holiday, many Algerians spend the day with their family and friends.